Liverpool boss Jurgen Klopp has been given an injury boost as Alex Oxlade-Chamberlain is hoping to make his comeback from injury before the season is over. The 25-year-old has been sidelined since April after he sustained a serious knee injury in the Champions League clash with Roma at Anfield, at a time when he was establishing himself as a key figure under Klopp having made over 40 appearances for the Reds. 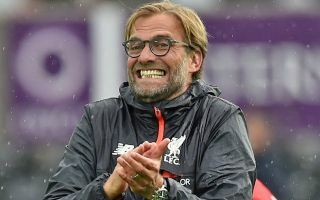 That in turn of course saw him miss the Champions League final, the World Cup and the start of this season, with Klopp himself previously suggesting that the England international could miss the entire campaign as he went through rehabilitation. However, Oxlade-Chamberlain has now suggested that he could be in contention to feature before the season is over, although he also concedes that it’s more so to boost his morale and get a feel for being back on the pitch before having a strong pre-season and coming back fully fit next year. “I’d love to be able to make an appearance at least before the end of the season,” he is quoted as saying by the Liverpool Echo. “Once the ball comes out, it will become easier. I’ve already started passing a ball inside which feels good. When I get outside, I’ll feel a lot closer. That sounds like a very sensible strategy and plan from the Liverpool midfielder, and Klopp as well as the supporters will undoubtedly be hoping to see him feature this season to help his own recovery process while also giving the team a boost in any way possible. With the Merseyside giants looking to compete on various fronts this season, having quality and depth in all departments will help them achieve their objectives and Oxlade-Chamberlain could yet hand them a major boost in midfield in the latter stages of the campaign. As seen in the video below charting his progress, it hasn’t been an easy process but the Reds ace made a point of thanking the fans for their support and will hope to repay that when he gets back out on the pitch.